Wikipedia defines Immunity as "a biological term that describes a state of having sufficient biological defenses to avoid infection, disease, or other unwanted biological invasion." Every parent hopes for a healthy child, one that will not get sick at every change of environment or temperature. Aside from the cost of the check-ups and medicines, expense that could have been more happily spent buying a new book or a trip, illness in the family disrupts routines and exhausts family members, especially if the sick one is a child. So how can parents build a great immunity foundation for their own children? Everything starts with the root. Parents who lead healthy lifestyles and eat healthy meals are more likely to produce healthier offspring. A healthy mom is less likely to have pregnancy complications and difficulties, and the baby is also more likely to be term and just the right size at birth. Mothers should also breastfeed their child exclusively for the first six months and to continue breastfeeding up to two years and beyond. This way, not only does a mother provide her infant with nutrition in perfect proportions but she also passes on her antibodies to her child. Breast milk also provides probiotics to the baby which can be very crucial in protecting her once she reaches an age wherein she puts everything in her mouth. Breastfeeding also limits the possibility of an infant getting diarrhea from non-sterile feeding equipment and water. What's more, an infant does not get exposed to processed cow's milk in formula, which contains hormones and other possible contaminants from all the handling and storage. Once a child is already ready for solids, pureed vegetables and fruits are the way to go. Providing only healthy options for babies will raise them eating right. Do not make processed food, junk food and fast food so readily available at home. And when you do go to fast food joints, always order the healthier options. Get rice and viand instead of french fries (which may be potato but has very high sodium content). For school age kids, prepare snacks and baons ahead of time for easy reheating and packing in the morning. Make your own chicken nuggets and pork balls instead of buying them to make sure there are no artificial seasonings. Extend fried meat favorites with vegetables, or make empanadas instead. Provide variety so the child is more likely to eat. Take a leaf from bento boxes, put something of everything good for each meal. So for lunch, pack a golf-sized ball of rice, some vegetable strips, a hard-boiled egg, 2-3 chicken nuggets and a banana. The next day, pack a tuna sandwich, apple and milk instead. 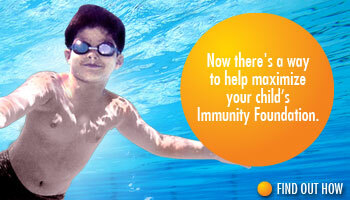 Providing the proper nutrition is just one factor of Immunity Foundation. Lifestyle is equally important as well. Babies need all the sleep they need and kids should not be driven to and fro so many activities day in and out. It is important that routines are established so they get adequate rest and sleep during the day. It is also very important that they engage in activity daily. Play should involve movement. Being exposed outdoors, to some sun and fresh air, is imperative. It is also very important that you work with a pediatrician you trust who will advise you lengthily about your son's nutrition, development and vaccination. Do all this and your child will be set on the right track and there would be less worries and possible heartaches in future. it helps me a lot for the immunity development of my child..